The dimensions of the A series paper sizes, as defined by the ISO 216 standard, are given in the table below the diagram in both millimetres and inches (cm measurements can be obtained by dividing mm value by 10). 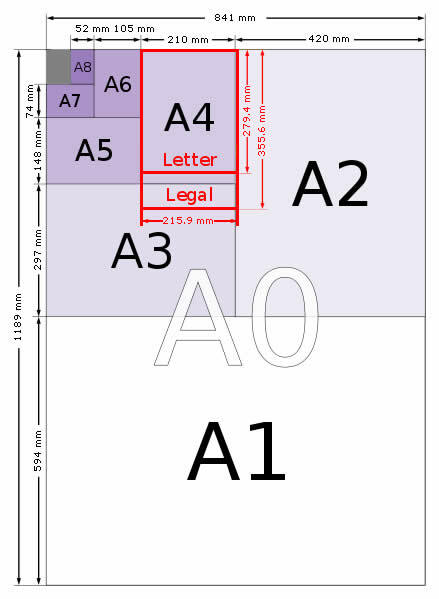 The A Series paper size chart, below left, gives a visual representation of how the sizes relate to each other - for example A5 is half of A4 size paper and A2 is half of A1 size paper. To obtain paper sizes in centimetres, convert mm values to cm by dividing by 10 and in feet by dividing inch values by 12. More units here and sizes in pixels here. The paper sizes bigger than A0, 4A0 & 2A0, aren't formally defined by ISO 216 but are commonly used for oversized paper. The origin of these formats is in the German DIN 476 standard, that was the original base document from which ISO 216 was derived. 2A0 is sometimes described as A00, however this naming convention is not used for 4A0. The A0 size has an area of 1 square metre. Each subsequent size A(n) is defined as A(n-1) cut in half parallel to its shorter sides. The standard length and width of each size is rounded to the nearest millimetre. Note: For reference the last item is there because the root 2 aspect ratio doesn't always give a whole number. For more information about A paper size areas and areas of sizes other than A0 in square metres and square feet click here. The A series paper sizes are now in common use throughout the world apart from in the US, Canada and parts of Mexico. The A4 size has become the standard business letter size in English speaking countries such as Australia, New Zealand and the UK, that formerly used British Imperial sizes. In Europe the A paper sizes were adopted as the formal standard in the mid 20th century and from there they spread across the globe. RA & SRA sizes define untrimmed paper for commercial printing. These formats are designed to allow for ink bleed during the printing process so that the paper can then be trimmed to one of the A series sizes. Click here for more on RA & SRA sizes. A3 Plus, or Super A3 as it is sometimes known, is not an ISO 216 paper size. It has dimensions of 329mm x 483mm (13" x 19"). This gives it an aspect ratio of 1:1.468 rather than the 1:root 2 aspect ratio of the ISO series paper sizes. In actuality the A3+/Super A3 name is quite misleading as this paper size is known as B+ or Super B in the United States and is ANSI B with a 1" margin for print bleed.